Belmond Northern Belle Train Aberdeen is a trip on the Belmond Northern Belle Of The North and makes a super treat and a great way to see the North East countryside. There are also departure points for the Belmond Northern Belle throughout Scotland and the British Pullman throughout England. From the moment of arrival passengers receive VIP and first class treatment. The staff wear smart livery and uniforms, there are red carpets inviting you to the carriages, doors are opened and your glass is never empty as you enjoy fine wines and five star dining with a four course silver service lunch or dinner. Further Information or to book a trip on the Belmond Northern Belle from over 80 UK train stations. 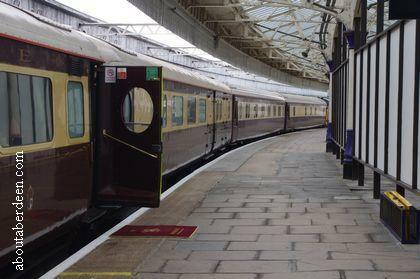 The Belmond Northern Belle Aberdeen train which travels throughout Scotland consists of refurbished British Rail Mark II carriages. 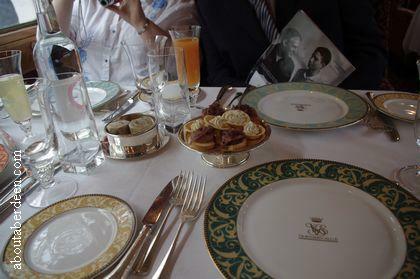 The dining cars are named after British stately homes and castles. These include the Alnwick carriage, Belvoir carriage, Chatsworth carriage, Glamis carriage, Harlech carriage and the Warwick carriage. 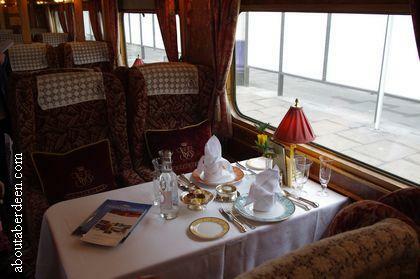 Each of the carriages are styled for each specific stately home or castle. 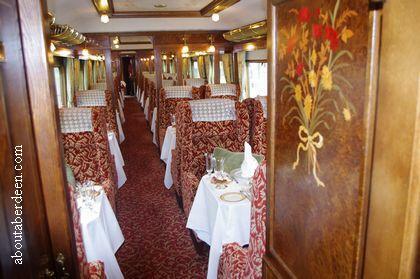 For example the About Aberdeen team enjoyed a trip in the Chatsworth carriage and the wooden interior was styled with yew tree, sycamore, walnut, maple and satinwood whilst the metal work was golden and the seats a light fabric with deep purple cushions. The flowers on the table reflect the country from which each is named. So for example the Welsh Harlech Castle carriage had daffodils whilst the Warwick Castle carriage had roses. Each rose or daffodil was accompanied by an attractive thistle to reflect the Scottish train day trip. They have been restored to the 1920s and 1930s era with plush upholstery, solid brass fittings, wooden veneers and softly shaded lamps. The two carriages by the engine are the staff quarters which consist of sleeping quarters, eating area and lounge so that the staff can relax between Belmond Northern Belle day trips throughout the UK. As well as the Aberdeen pick up point the Northern Belle has other Scottish pick up points such as Edinburgh, Glasgow, Dingwell and Elgin. It takes its passengers to top Scotland locations such as Mull or Oban via the picturesque West Highland Line and Loch Lomond. Lunch and diner meals enjoyed by previous passengers include Scottish favourites such as Cullen skink soup, venison in a whisky jus, Scots cheeseboard, chocolate torte, coffee and chocolates. It also departs from Victoria Station in London, England to other English destinations such as Bath, Wilton House, Salisbury, Longleat, the Cotswolds, Blenheim Palace, Worcester and Canterbury. There is a dress code for those travelling and it is best to check this at the time of booking your seat. Generally smart dress is required with no passengers being permitted to travel in jeans, t-shirts or trainers. When About Aberdeen travelled aboard the day trip around Scotland all the men wore suits and ties whilst the women wore dresses. Trains are non smoking and passengers are asked to turn off their mobile phones so that they do not disturb other passengers. Special trips usually run in December. These depart from various stations around the United Kingdom such as Bristol, Cardiff, Chester, Crewe, Edinburgh, Glasgow, Halifax, Harrogate, Leeds, Liverpool, London, Manchester, Shrewsbury and York in the run up to Christmas. These include the fine dining experience and an opportunity to visit traditional Christmas markets for a festive shopping experience. Some include Christmas lunch or Christmas dinner. 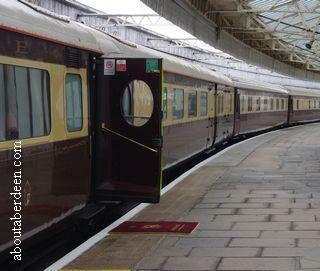 Some of the Scottish Belmond Northern Belle trains will be diesel locomotives rather than steam engines. 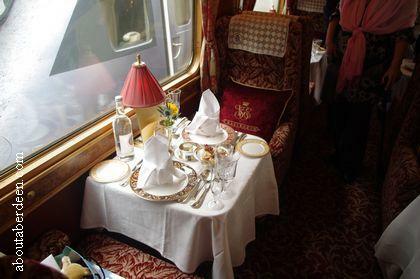 The About Aberdeen Belmond Northern Belle review was for the day trip from Aberdeen train station around the Scottish countryside with a lunch. 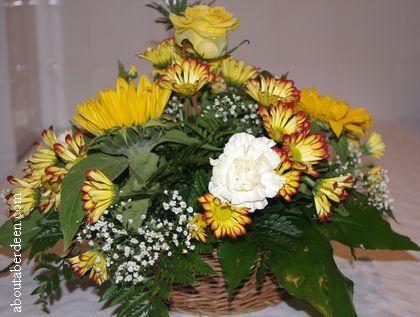 We also ordered a basket of blooms at an additional cost of *pound;50. The flowers were waiting on the table at our boarding and during lunch the steward took them to their cold storage room to keep fresh whilst we enjoyed our lunch. When the table was cleared the flower basket was returned. 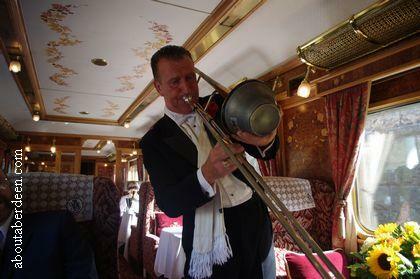 Throughout the whole Belmond Northern Belle experience the staff were ever so polite and nothing was too much trouble. Their poor jaws must have been sore at the end of the day from smiling! Tickets arrived a few days before departure and we were kept informed of departure times and terms and conditions by e-mail. Paying by credit card was so easy and by naming each passenger we were sent personalised tickets and a boarding card which they call an Invitation to Board. This details the carriage name and seat number for each passenger with the departure and arrival time. There was also a detailed itinerary. We parked at the public car park beside the BT building which is sign posted for the long stay railway station car parking. It cost £6 for the day which was cheaper than the main Union Square car park. Do remember to go to the lower levels for this cheaper car park charges. A short walk way takes you to the trains and there are two lifts to the platforms for disabled people. It is recommended that passengers arrive at least 20 minutes before departure which is prompt. It sadly cannot wait for late passengers. AboutAberdeen arrived one hour before departure so that we would have time to take photos for this Belmond Northern Belle review and there were already seated passengers. There are three stewards per carriage and several managers for the train. We were all greeted upon arrival and shown to our carriages. A red carpet takes you to the carriage doors which are opened by stewards. The disabled person in our party was helped aboard. The stewards are happy to take photographs of the party on the platform and inside the carriages. They also gave a history of the train and the carriages and were able to help answer questions throughout the day. The seats are ever so plush and comfortable and huge cushions are available. The flooring of the carriages are deep wool Axminster carpets. The tables were already laid for silver service dining and included an immaculate starched white tablecloth and napkins, silver vase with flowers, silver salt and pepper pots and a range of glasses for the complimentary water, champagne and wines. Each table can have a choice of still or sparkling water and a £21 bottle of wine per couple. As we were a group of four we were given a £42 alcohol allowance even though two of the group did not drink alcohol. They were given free non alcoholic drinks throughout which included mango J2O, apple juice and water. 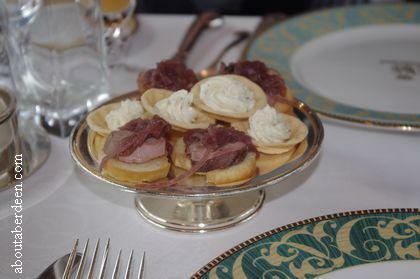 Upon arrival tables there were two canapes per passenger which were of soft cream cheese and venison with red cabbage and really delicious. Once seated the stewards (Sandra, Joe and Stuart) poured a complimentary glass of champagne which was later topped up prior to lunch. 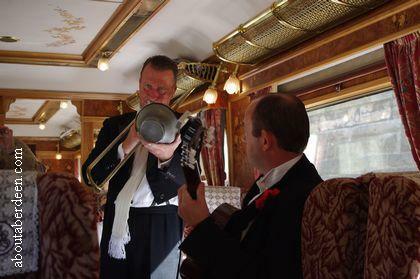 When we learnt that we would not be getting off the train like previous day trips AboutAberdeen thought that the time may drag and planned to start writing our Belmond Northern Belle review, but time goes really quickly and the meal and on board entertainment helps fill the time. The trip was for over 6 hours and a distance of 273 miles. The route was from Aberdeen, through to Portlethen, Stonehaven, Laurencekirk, Montrose, Arbroath, Carnoustie, Golf Street, Barry Links, Monifieth, Balmossie, Broughty Ferry, Dundee, Perth, Ladybank, Markinch, Glenrothes with Thornton, Cardenden, Lochgelly, Cowdenbeath, Rosyth, Aberdour, Burntisland, Kinghorn and back to Aberdeen following the same route. We were not able to leave any of the stations and no more passengers were boarded at any of the train stations. A free map of the route was provided on the tables. We felt really decadent waving to sightseers, trainspotters and other passengers on the platforms! Once it was underway the Stewards introduced themselves and explained about the complimentary wine (we choose a fine red Rustenberg John X Merriman Stellenbosch from South Africa) and how to purchase other drinks like whisky, additional wine and champagne, cognac, vodka, rum, gin, beer etc. Prices of these were displayed in the lunch menu booklet and charged at the end. The first round of entertainment on the journey was a singer and guitar player and trombone player with silencer on the end. The were dressed like 1920s musicians with long tails and spats with a pencilled moustache. The musicians were great fun and very talented and chose an appropriate melody and requests were taken. But be warned! 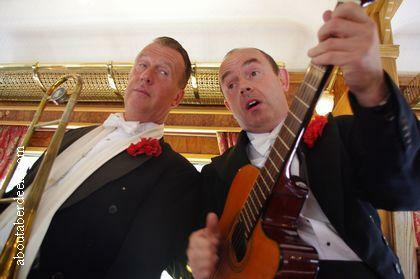 Those who did not sing along were treated to the wit of the train musicians - "I've seen more life in a tramp's vest!" was told to me when I did not sing along! Do visit the toilets which are so plush with porcelain toilets and basins, tiled mosaic flooring and Molton Brown soap. The towels are cotton and single use and the toilet paper ever so soft. The walls have artwork: all in all a much posher toilet train than any member of About Aberdeen has seen. Sadly our huge Pentax camera was too obvious to take a pic of without looking odd! There are two bathrooms between carriages and across from these are cloakrooms for coats and any luggage. Above each table in the carriage were gold coloured luggage racks which are handy for coats, camera cases, etc. Lunch is expertly served by the stewards by silver service. The motion throughout the journey was ever so smooth; so no spilled food. For a starter we had a medley of Kentish farm asparagus with parmesan and garlic dressing. There were about six pieces of deliciously cooked asparagus. Throughout the lunch the portions were large and seconds were offered when requested. This was followed by Cullen Skink served with smoked bacon lardons and a choice of freshly baked bread such as sun dried tomato or cheese and potato. 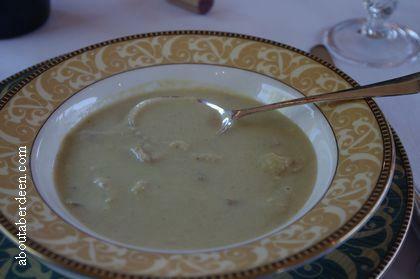 One of our party did not like Cullen Skink and was offered a vegetable broth alternative. 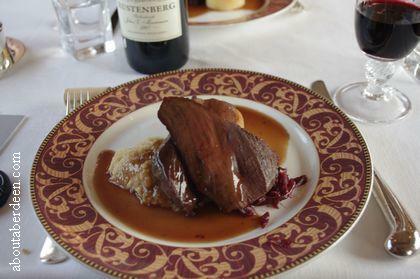 The main course was seared fillet of Roe Deer, fondant potato, roasted parsnip puree and sloe berry jus. This still makes my mouth water as I write this review. The roe deer was so succulent. The lovely thing about having lunch is that no course was rushed. It was so relaxing to have a leisurely lunch with fine company whilst watching the Scottish countryside. The Great British Cheeseboard and Home-Made Chutney course filled a cheeseboard that stretched across the two tables of the aisle. The stewards offered from the choice of six cheeses which included brie, blue cheese, apple smoked cheese, soft cheese and cheddars served with water biscuits and oatcakes. The chutney was a sweet yellow tomato chutney. The cheese board came round twice, though readers should be advised to leave room for the dessert! 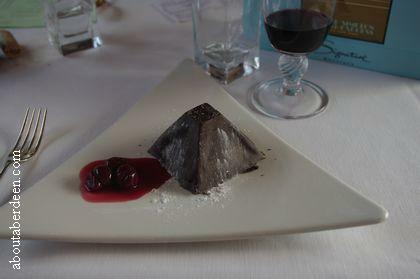 For pudding there was Liquid Chocolate which was a large triangular hard chocolate with a soft chocolate centre served with cherries and cherry syrup. The coffee and tea was served from silver pots and was a refreshing Rainforest Alliance coffee served in dainty china cups and saucers. The stewards returned with refills and complimentary chocolate truffles which were presented in a special box which could be taken away or eaten during the experience. Our chefs were chef Alex Dobson and executive head chef Matthew Smith. Some of the passengers chose to have a wee nap whilst others enjoyed the chance for more conversation. The stewards are so sleek of movement and ever so quite and non intrusive. They are very good at gauging the mood and needs of their passengers and seem to know when to have a laugh or ask if you'd like more to eat or drink. The train driver announced a welcome and departure message over the tannoy and kept us informed of any delays such as why we were stationary in Dundee train station. The carriages were pulled by a Class 37 Locomotive which was built between 1950 and 1960. There was no rush to depart and the stewards helped passengers off the train and said a lovely farewell. This was an ideal time to leave tips and for awaiting family to take photos. A promotion code for the Belmond Northern Belle was given in the booklet for another visit or to pass on to family. This gives 10% off a future journey.  An ideal use would be to buy gift certificates for family. Belmond Northern Belle lunch often appears as a challenge on the BBC programmes Masterchef and Celebrity Masterchef on BBC1 and The Restaurant on BBC2. The chef contestants have to prepare lunch for passengers using the small kitchen onboard with challenges such as the moving train and less equipment than a large kitchen.